Lexi Rydalch is now the all-time leader in career points in the West Coast Conference. Photo by Bradley Slade. College-basketball legend Hank Gathers long held the West Coast Conference (WCC) record for career points. For 16 years. Until a 5′ 10″ BYU guard with a ponytail usurped him. 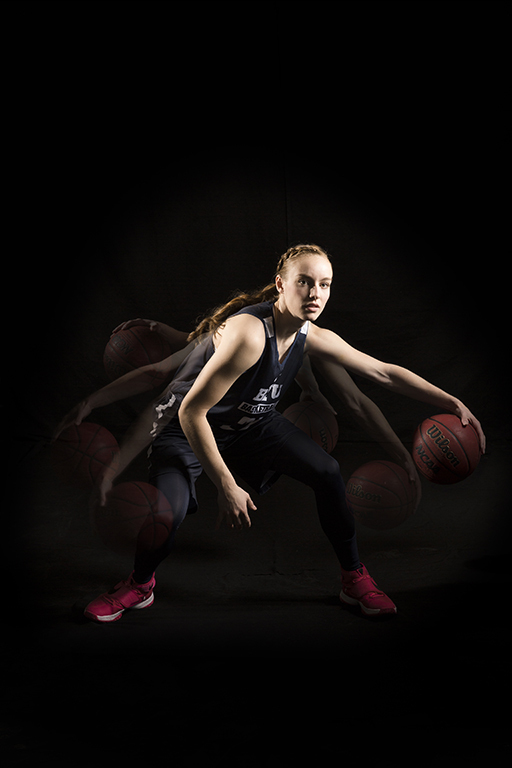 In March Lexi Eaton Rydalch (BS ’15) bested Gathers’s career 2,490 points to become the WCC’s all-time leading scorer—with an average 24.3 points a game, and she earned WCC Player of the Year. She also surpassed Danny Ainge on BYU’s all-time scoring lists. “I guarantee you that she’s had that in her dreams that she was going to do that,” says BYU head coach Jeff Judkins. She’s also a leader, says teammate Kylie Maeda (’16), who recalls Rydalch working on her three-point shooting in the off season—every day. “Seeing one of our best players working really hard, that motivated us to work hard ourselves,” says Maeda. And Rydalch is the one getting the team together on a free Saturday to help special-needs kids, Maeda adds. Rydalch sets the tone. And then there are her young fans. The day before Valentine’s Day, the team won at home against Santa Clara, and in the stands “was a little girl that had the same hairdo as me, and she had a rose and a cute little note for me.” Rydalch responded with a high five and posed with her hair-twin for a photo.